When I was 15 years old in 1946 my eldest brother took me to West Ham speedway. There was 40,ooo fans there and we had to queue up for 20 minutes to get in, but when the racing started I was hooked and have been for the last 65 years. The crowd was deafening with their chants - "2-4-6-8 who do we appreciate" and don't forget the rattles. Bruce Penhall winning the world title at Wembley and me wining my first race at Edinburgh in 1961. It's got to be Jack Young anybody that went to West Ham will know why I chose him. Edinburgh, Old Meadowbank stadium. What a nice track to race on. I would like to have been a team rider there. The friendliness of the supporters and winning my first ever race at West Ham in 1953. Most tracks I've been to take too long to get the riders out for the next race. Then it's the dreaded curfew time and you end up not being able to see the last two races??? What one thing would you do to improve speedway? Give the second string riders 20 yards start, that would make the racing a lot closer. Bluey Wilkinson. From the storys I've read about him he was a rider ahead of his time. What does the future hold for speedway? The only tracks that will survive in the future will be stadiums built just for speedway and dare I say it ones with a sliding roof that make rained off meetings a thing of the past. Fans would turn up in any weather knowing the meeting is on. "Thank you for printing my comments and a special thank you for printing the photo of the Old Meadowbank track." "Great site! 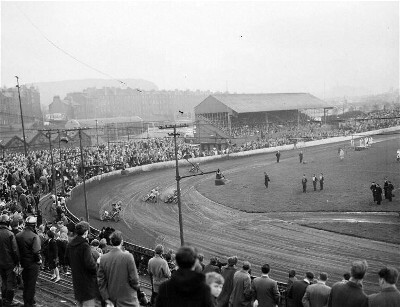 Nice shot of Old Meadowbank, a real track with a great promoter Ian Hoskins. Tremendous provincial league clashes between Monarchs and Newcastle Diamonds. Phrases in programmes, such as get in early [Brough Park] before the Monarchs fans pinch your places! [500 plus of them!] Most surprising "find" was discovering speedway at Cloverdale (British Columbia) in 1984, run by ex Cradley supporters. I noticed one 15 year old kid looked as if he knew what he was doing, and was glad he made it over here a few years later. Anyone remember shawn venables? Pity speedway couldn't get a regular hold in B.C. "